Go Rubbish Go. 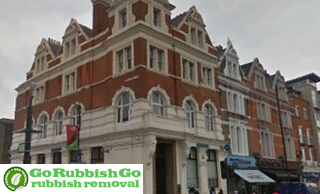 is the go-to house clearance company in Clapham. We offer SW4 rubbish clearance services at standards that will not be beaten elsewhere. We offer services for a variety of waste disposal circumstances. Apart from a standard house clearance, our services also extend to office clearance, furniture clearance and even builders waste clearance. There is no circumstance that we are not prepared for. 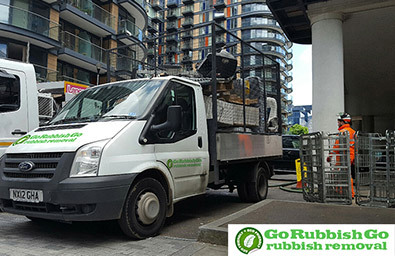 Our team of expert staff members are not only the most skilled in waste collection in Clapham, SW4; they are also fully trained in providing an eco-friendly service all over SW11. With us, you can rest assured that a large percentage of your waste items will be found a home for re-use, or will be recycled altogether. We try our very best to keep any additions to the landfills to an absolute minimum in order to care for the environment as best we can. 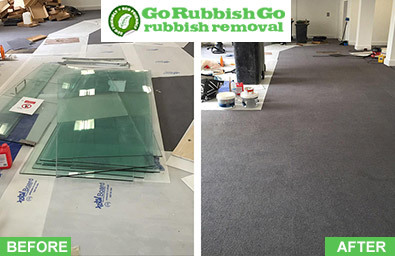 For professional standards, skilled staff and eco-friendly Clapham waste removal service, why not book today? For more information, a free quote on our low prices or to book a team for your property, call 020 8610 9182 now! Moving home or into a new office often leaves us with piles of old junk which we have no means of disposing. Give Go Rubbish Go. a call! With our rubbish removal SW4 service, you can rest assured that your waste is in good hands! Our team of professionals will leave your property in Clapham clear of all your old waste, so you don’t need to worry. Each member of our staff is trained to lift and transport even the heaviest of items around the SW4 region, without risk of damage or injury to themselves. Hired them to clear my garden in Clapham from debris and branches left after some tree surgery I did. They worked very fast and the price for the waste collection service was surprisingly low too. Will recommend in SW4! Call Us for Professional Rubbish Removal SW4 Services! Not only do we provide the most skilled staff around, we also provide transport to dispose of your waste, and all equipment that we could possibly need, included all in one affordable price! With our full waste clearance Clapham service, there is no need for you to waste your money on skip hire, and there’s no need for you to waste your time on a skip permit because we have it all covered for you. Value for money for our customers in the SW11 is one of our main priorities. We work hard to insure that our prices are kept low whilst our standards stay high, so call us today on 020 8610 9182 for your free quote! Hire Our Clapham Waste Disposal Service And We Will Make Your Life Easier! When the summer months are coming around, you work hard to prepare your home for those rare moments of London sunshine so you and your family can take full advantage. Hire us and we will work hard to clear away your rubbish, get rid of all of the unwanted bits and bobs, and recycle your chairs and tables! Unfortunately it is difficult to enjoy the free space in your home when you have a plethora of SW4 waste disposal needs. Our Clapham rubbish disposal service can take all of this away for you and leave you free to enjoy your beautiful and clutter-free home for those few days that the sun decides it will show up! Clapham is a district in South West London, within the borough of Lambeth. Clapham boasts something for everyone, with its variety of different scenes. Not only does it offer a party atmosphere that attracts post-graduate students to live in the area, but its cultural, historic town atmosphere is also appealing to its calmer residents. Clapham Common spends the majority of the year playing host to a variety of events. Some of these include firework displays, sports events such as Race for Life and the annual Common Fayre – all of which attract new visitors to the area, as well as keeping the local residents entertained. The Venn Street market is another place that attracts visitors from all over. It is a local market that runs every Saturday and offers local produce, fresh fish, plants and crafts, bringing the community together to enjoy the atmosphere. Another attraction of the area is the Landor Theatre, located above the Landor Pub. It is said to be one of London’s finest theatres.